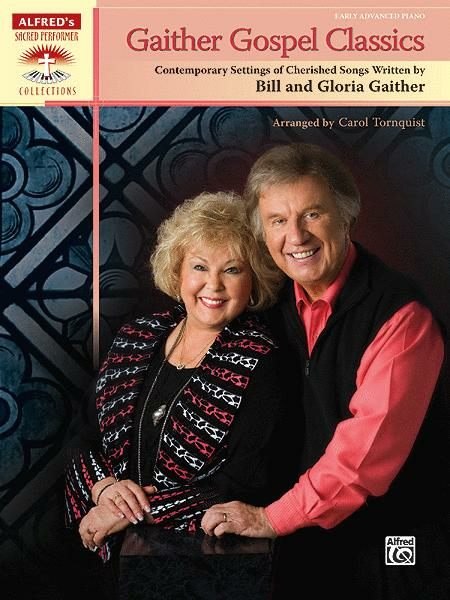 Contemporary Settings of Cherished Songs Written by Bill and Gloria Gaither. Composed by Bill and Gloria Gaither. Arranged by Carol Tornquist. Other Church; Piano Collection; Piano Supplemental; Worship Resources. Sacred Performer Collections. Contemporary Christian; Gospel; Sacred. Book. 40 pages. Alfred Music #00-33465. Published by Alfred Music (AP.33465). The gospel songs of Bill and Gloria Gaither have been cherished for generations. This collection features contemporary solo piano arrangements of their most popular melodies. Approximate performance times are included. Titles: Because He Lives * Come, Holy Spirit * The Family of God, with Jesus, We Just Want to Thank You * Gentle Shepherd * He Touched Me * I Will Serve Thee * Jesus Is Lord of All * The King Is Coming * The Longer I Serve Him * Something Beautiful * There's Something About That Name. Alfred's Sacred Performer Series offers church musicians a great source of beautiful piano arrangements of both traditional and contemporary sacred literature, ideal for use in general, seasonal, and special services such as weddings and funerals. I would recommend this book to a church pianist who likes Gaither songs who serves a church congregation that does. Most songs are easily prepared. There are many key changes and songs run 3 to 4 pages. Print is large enough to be easily read. As usual Carol Tornquist puts a different spin on old favorites and they become refreshingly new. 14 of 23 people found this review helpful. July 15, 2012 I recommend this book for church musicians! amount of time. I like the fact that most of the songs do not have too many sharps, which makes it easier for me to play. The only thing I dislike about the book is that I wish it included more songs. 14 of 25 people found this review helpful.